﻿Skip the centerpiece medallion, and on the ten beads after that, pray a Hail Mary on each bead; on the chain, pray a Glory Be. 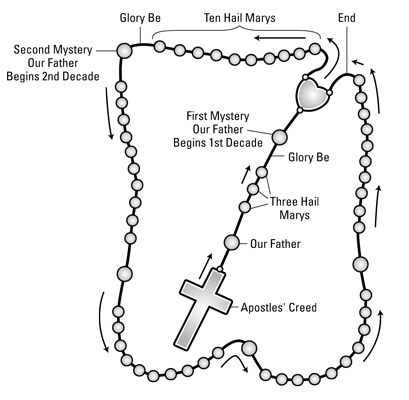 Although a decade is 10, these 12 prayers form a decade of the rosary.Many Catholics add the Fatima Prayer after the Glory Be and before the next Our Father: O My Jesus, forgive us our sins, save us from the fires of hell and lead all souls to heaven, especially those in most need of Thy mercy. Amen. At the end of your Rosary, say the Hail Holy Queen.Hail, Holy Queen, Mother of mercy, our life, our sweetness, and our hope. To thee do we cry, poor banished children of Eve, to thee do we send up our sighs, mourning and weeping in this valley of tears. Turn then, most gracious advocate, thine eyes of mercy toward us; and after this our exile show unto us the blessed fruit of thy womb Jesus, O clement, O loving, O sweet Virgin Mary.